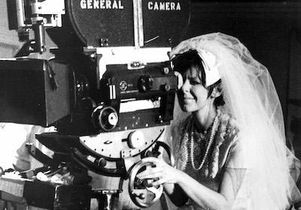 Beginning Jan. 25, the UCLA Film and Television Archive presents “Liberating Hollywood” — a film series that examines how evolving social and industrial conditions allowed the number of women directing feature films to increase significantly during the 1970s. From the mid-1930s until the mid-1960s, only two women had careers as directors in Hollywood: Dorothy Arzner and Ida Lupino. By 1980, there were an estimated 16 women directing feature films in and around Hollywood. In her new book, “Liberating Hollywood: Women Directors and the Feminist Reform of 1970s American Cinema,” scholar Maya Montañez Smukler argues that the 1970s represents a crucial decade for women directors working in and around Hollywood. Still suffering from a postwar slump, the film industry in the 1960s and into the early 1970s was forced to reckon with a growing independent filmmaking community, the enduring dominance of television, and a changing audience demographic whose tastes were influenced by the many social movements of the era. During these years, second-wave feminism challenged all parts of the social, political, and cultural landscape in the United States, including the institutionalized sexism that ran rampant in Hollywood. Co-curated by Smukler, the series will hold screenings on eight nights. The films on the schedule will showcase the wide variety of narrative films directed by women who began their careers during this critical decade. Working across production cultures — from low-budget exploitation, to independent art house cinema, and the Hollywood studio — these women made their mark in one of the most mythologized eras of American cinema. Smukler will sign copies of her new book on Jan. 25 and Jan. 26 and introduce each screening. This series was co-curated by and KJ Relth. All screenings begin at 7:30 p.m. and will be held in the Billy Wilder Theater inside the Hammer Museum at UCLA. To check out the full schedule and to purchase tickets for “Liberating Hollywood” click here. Still from “A New Leaf” (1971) written and directed by Elaine May.